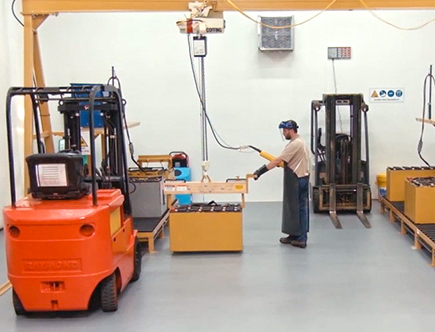 OneCharge is a leading US producer of Li-ion batteries for lift trucks / MHE. Our sole focus is on the MHI and we are developing a customized solution for every truck make and model. Our Versatile Product Line currently exceeds 450 models and growing, daily. We make batteries that fit Class I, II and III Lift trucks, Ground Support Equipment, Sweepers and Scrubbers and Personnel Carriers. Installation is easy – plug it in and get to work. OneCharge offers several options to customize batteries to meet your applications. Options include extra weight, external Battery Discharge Indicator, CAN BUS communication, a top seal kit and three different FROST packages for cooler and freezer environments. We have a dealer network in place in North America so we can insure timely and quality service to their clients. Advantages to using OneCharge batteries? We present the latest, state of the art technology. Our solutions bring a noticeable economic benefit. The return on investment period with our solutions generally does not exceed 3 years and are often 1.5-2 years. We have developed a range of batteries optimized to the needs of various warehouse operations of our customers worldwide. OneCharge batteries are priced to maximize our customers’ savings and will reduce the total cost of ownership over the lifetime of the battery. OneCharge works only with the most reputable suppliers. OneCharge Batteries have a standard 5-year warranty.